It's finally back! This is probably the world's most famous Kriek, and was the inspiration for this section. This beer has been unavailable in Australia for about the last 3 months, but it's back now and hopefully it's good! 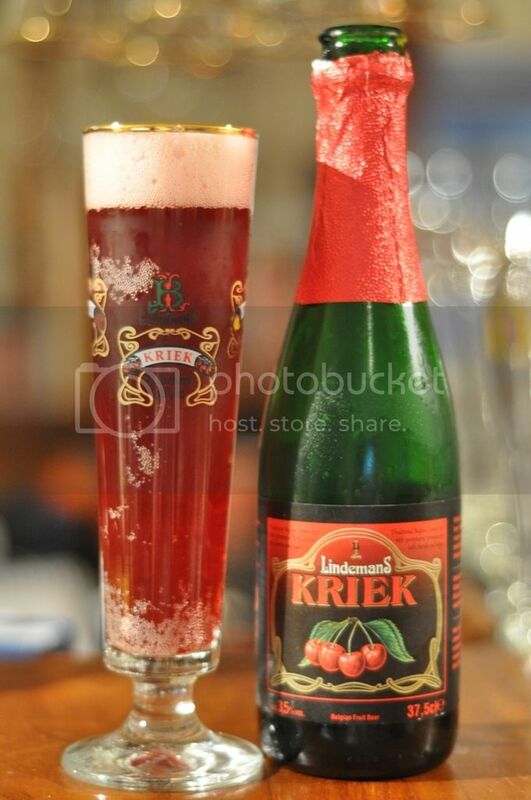 A Kriek is one of the more sour fruit beers, as it is made with predominantly sour cherries. Roughly 30 kilograms of cherries are used by Lindeman's to make one hectolitre of beer, that's alot of cherries! This particular one is a fruit lambic and one that I'm really looking forward to! Let's do this! I popped the top on this one and had my first surprise, this beer has a cork! I luckily found a corkscrew and got this one open, unsurprisingly it pours a deep red colour with a pink head. The head is a tinted pink colour and there seems to be lots of bubbles, as you can see stuck to the side of my (clearly!) not well cleaned glass... Anyway the colour is a fantastic red colour and I don't think you can ask for much more from a fruit beer. The odour is undeniably that of cherries, it's incredibly intense and really plain fruity. My first thought was that this smelled incredibly like children's cough medicine, or at least the one I used to have as a kid. The cherries smell both sweet and sour, with the sour ones being more prominent with just fleeting hints of the sweeter ones that lie below. Obviously this beer tastes like cherry but it's so much more than juice cherry juice! The beer is much tarter than I hard expected, however as this initial tartness subsides it has quite a sweet juicy beer which is surprisingly refreshing. The beer is beautifully balanced and the flavours hover between sweet and sour cherry, there really isn't alot of flavour diversity to this beer, it's just cherry, cherry and more cherry; but damn it's good! Like all fruit beers this one certainly won't appeal to everyone. The tartness of this beer will certainly help more people to like it, however it is undeniably not your average beer. Lindeman's obviously use very high quality cherries and this shows in the incredible tasting beer. The drinkability of this one would probably be quite low because of the sugary qualities of this beer. Lindeman's Kriek is probably one for a hot summer day, or maybe the perfect beer to convince the missus that beer is good. Anyway I enjoyed it, and this is one that is definitely worth a try.